It's the wonderful Disney fairy tale princesses! 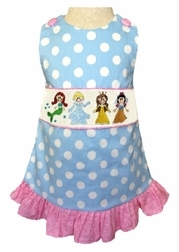 We have Ariel, Cinderella, Belle OR Sleeping Beauty, and Snow White just waiting for their handsome princes! 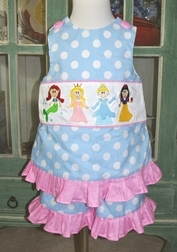 The dress/swess top (2 inches longer than a swing top) and trousers are made with blue with white dots fabric with the shoulder straps fastening with pink swirls fabric covered buttons. 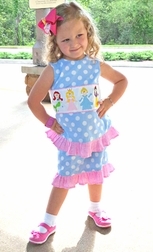 A pretty coordinating pink ruffle embellishes the hem of the dress, swess top and shorts. 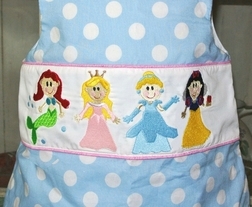 Beautifully stitched, and very colorful!